My current research interests fall into a small handful of (partially interrelated) projects. In a recent paper (“Inertial motion, explanation, and the foundations of classical spacetime theories”) I made the proposal that the best way of thinking about the mathematical foundations of a physical theory is as a network o f mutually dependent, inter-derivable principles. 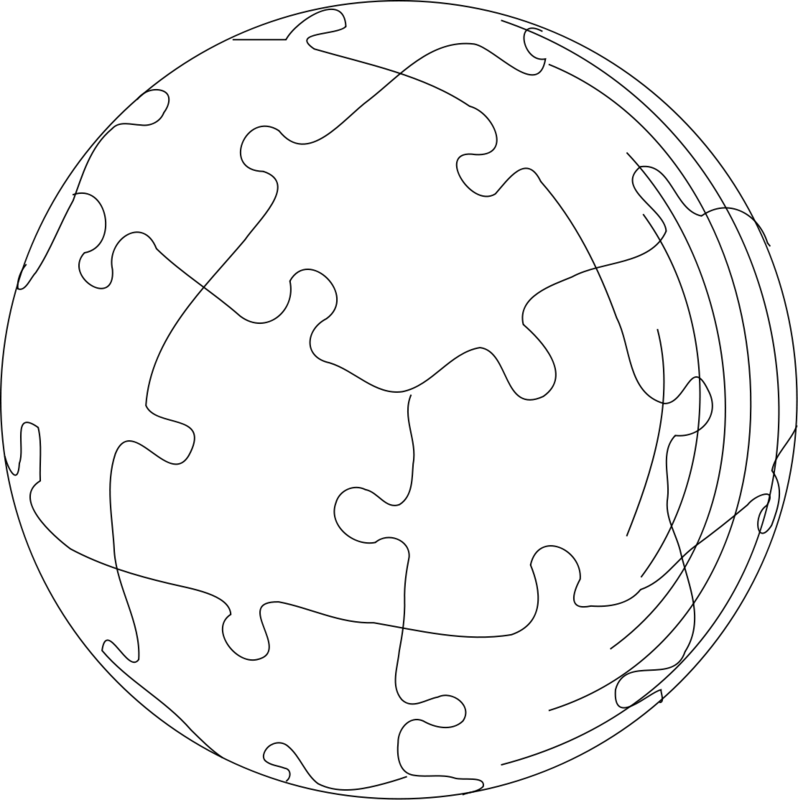 I called this proposal the “puzzleball conjecture”, since the basic claim is that the foundations of a theory support and constrain one another like the pieces of a spherical puzzle. This proposal was motivated, in part, by an analysis of the sense in which one might say that inertial motion is “explained” in classical spacetime theories, such as general relativity and geometrized Newtonian gravitation. The starting point of the analysis is that in both of these theories, there is a sense in which one can prove the geodesic principle — the principle governing inertial motion in the theories — as a theorem. But these theorems have assumptions, and it is hard to see why those assumptions should be taken to be somehow more fundamental than the geodesic principle itself—particularly because many of these assumptions are in turn provable as theorems, starting from different assumptions. Given this situation, it seems arbitrary and unhelpful to insist that some particular collection of principles of these theories encompass the truly fundamental ones, whereas others are derived. Instead, it seems that the more fruitful project is to recognize the complexity of these interconnections and to try to explore them. I am currently working to explore these interconnections in more detail by providing the sort of analyses that I gave of the geodesic principle to theorems showing how other central principles of these theories–such as Einstein’s equation and the geometrized Poisson equation–are unique or necessary. (For more on this and related topics, see “The Motion of a Body in Newtonian Theories”; “On the Status of the Geodesic Principle in Newtonian and Relativistic Physics”; “A brief remark on energy conditions and the Geroch-Jang Theorem; and especially “Inertial motion, explanation, and the foundations of classical spacetime theories”). Another current project concerns a cluster of issues related to classical gauge theories. The focus has been on geometrical formulations of Yang-Mills theories, though I have also been writing about the senses in which classical spacetime theories, such as general relativity and Newtonian gravitation, should (and should not) be thought of as gauge theories. The basic idea behind this cluster of projects is that standard discussions of gauge in both the physics and philosophy of physics literatures appear (to me) to conflate two very different ideas. On the one hand, one has situations in which the models of a physical theory may be represented (set theoretically, say) in many different ways, even though the models are isomorphic (as mathematical objects of the relevant sort). Though this situation is actually generic, in some cases, such as general relativity, this sort of freedom is described as “gauge freedom”. On the other hand, one has situations in which there are many non-isomorphic models of a theory that are nonetheless empirically indistinguishable. This is the case, for instance, in classical electromagnetism when one represents models using a vector potential — and of course, the ability to transform between vector potentials without changing the physical content of a model of classical EM is also referred to as “gauge freedom”. In both cases one has a kind of representational freedom, but the differences between the two cases are profound. My general thesis in this work is that it is only in the second case that one genuinely has “surplus structure”, and for this reason I think the expression “gauge freedom” should be reserved for those theories, whereas “gauge transformation” should only be used for maps that are added “by hand” — i.e., that are not isomorphisms of the underlying structure, but nonetheless relate physically equivalent models. A natural goal, then, is to try to find formulations of theories that are gauge invariant in the sense that the physical equivalences are fully captured by the isomorphisms between the models that one “gets for free” from the mathematical structures involved (and then formulate the theories in ways that are invariant under these isomorphisms). Thinking this way provides some insight, I believe, into classic debates on spacetime theories — such as those concerning the “hole argument” — and also into more recent problems in Yang-Mills theories, including the status of the “gauge argument” and the relationship between so-called fiber bundle interpretations and holonomy interpretations of these theories. Recently, Hans Halvorson and I have been collaborating on adapting tools from category theory for use in the philosophy of science, particularly for the purposes of understanding the relations between physical theories. This project is inspired by recent work in categorical logic (notably, Awodey and Forssell’s recent work on the categorical duality between syntax and semantics), and builds on Hans’ recent paper “What Scientific Theories Could Not Be” (2012) and my paper “Are Newtonian gravitation and geometrized Newtonian gravitation theoretically equivalent?”. Hans’ paper might be best understood as an argument that, at least for certain purposes, the technical tools associated with the so-called “semantic view” of theories are inadequate, and that category theory is a natural place to look for the more sophisticated tools one requires. Meanwhile, in my paper I argue that a certain criterion of theoretical equivalence proposed by Clark Glymour (and, it seems, inspired by the semantic view) fails to capture an important sense in which two theories may be equivalent. I then show how one can capture the difference between Glymour’s criterion and an alternate criterion I propose very naturally by representing theories as the category of their models. This is at least one example in which category theory seems to help clarify an important question in the philosophy of science. This work dovetails with the work described above on gauge theories, since the working thesis of that project is naturally construed in terms of asking when one needs to add “extra” arrows to a category of models of a theory. Category theory allows one to take that project a step further, though, since in some cases one can show that a category with “extra” arrows is actually equivalent to another category, with no extra arrows, but whose models might be characterized in a different way. Hans and I, along with some other collaborators, have begun to explore how these ideas might find application more broadly in philosophy of physics and philosophy of science. Along with collaborators Nina Bandelj, Julia Elyachar, and Gary Richardson, I have been working on how to understand financial crises from a broad range of perspectives, including the mathematics of crisis prediction, the sociology and anthropology of crisis apprehension and response, the psychology of investor behavior, and the history of regulatory responses to crisis. Although I am involved in all parts of the project to some extent, my principle contribution concerns a methodological question about predictive models and crisis. In particular, it is now widely believed that many financial statistics are best modeled with heavy-tailed distributions. But there is some controversy about the exact nature of the tails of these distributions — and there is a sense in which, given any finite data set, hypotheses about tail behavior will always be less well supported than hypotheses about central behavior. The project concerns understanding how to best respond to such a situation. This work has developed in part out of my recent book The Physics of Wall Street. Although most of my recent work has been on foundational topics in classical physics, I have continued to work on some of the features exhibited by a class of five-level atomic systems I invented in collaboration with Chris Search at Stevens Institute of Technology. These systems, which we dubbed Dressed Interacting Ground State (DIGS) systems, consist of an excited state along with two pairs of ground states, and . Transitions within the pairs are driven by rf/microwave control fields while transitions between the pairs are assumed to be forbidden; the excited state is strongly coupled to by a resonant control laser. We have principally been interested in the optical response of the atom as measured by a weak probe field near resonance with the transition. The system might be implemented in, for instance, cold atoms. Our work on this system concerned its dispersive and refractive properties. My collaborators and I were able to show that under certain realistic parameter choices, one finds a wide frequency band of fully controllable dispersion and vanishing absorption. In fact, one can control the sign and magnitude of the dispersion by changing the relative populations of the ground states and , with maximum normal dispersion comparable to that exhibited by electromagnetically induced transparency and with maximum anomalous dispersion of the same order of magnitude. We have also shown that the system exhibits regions of both coherently enhanced ( ) and suppressed ( ) index of refraction, with vanishing absorption. In fact, by varying the detuning of the rf field driving the transition, one can create a broad frequency window in which the absorption is everywhere zero and the index of refraction is sustained at a constant value that is substantially larger or smaller than 1, which means one can exhibit large refraction in either direction without pulse reshaping for pulses with appropriate bandwidth. We have also shown that one can produce frequency bands where both the index of refraction is less than 1, and the dispersion is anomalous, leading to simultaneously superluminal group and phase velocities.